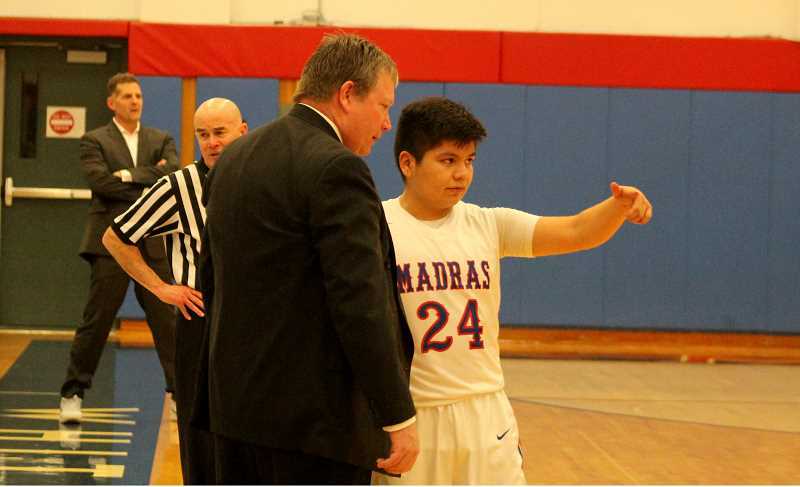 The winningest coach in Madras boys basketball history, Evan Brown this year decided it was time to stop coaching after 18 years as a White Buffalo. Brown took over for Joe Blincoe, who before Dec. 19 2017, had the most wins as a head coach. Blincoe and Brown were opposites when it came to coaching style, but very similar in a big way —winning basketball games. 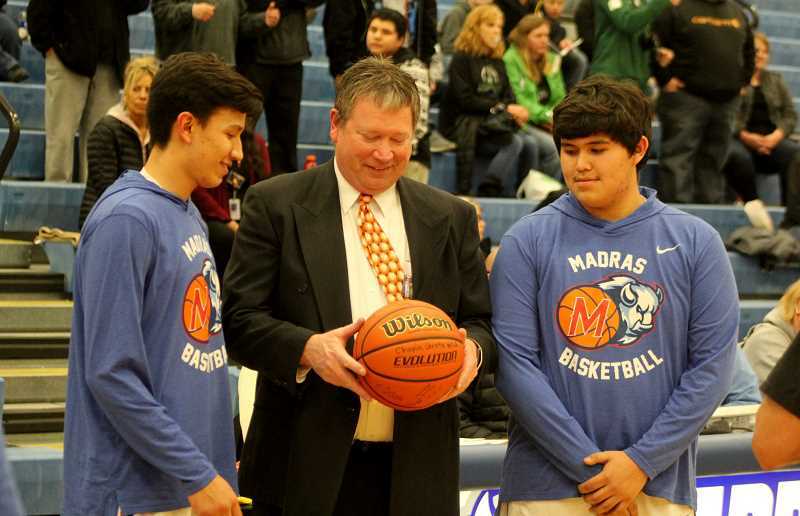 Brown started coaching for Madras in the winter of 1992-93, after Blincoe decided to retire. Blincoe coached for 16 years and recorded 266 wins and 12 state appearances. The first season started a little rocky for Brown, as his team was winless in their first six games. After the rough start, the Buffs and Brown turned things up a notch, ending the season with a 12-11 record, and making the state playoffs. In his span of 18 years, Brown led the Buffalos to 14 playoff appearances. Just two years after taking over for Blincoe, Brown and the White Buffalos were able to take third place at state, during the 1994-95 season and in 1997, Madras made it to the state championship game. The Buffalos lost in the 3A state finals 49-42 to Sutherland and placed fifth at state the following year. "When I started, there was no 3-point line," Brown said. "That is the biggest change in the game right there. The evolution of the 3-point line in the mid to late '80s. I remember my old Harrisburg team going to Lane Community College for a tournament and they had a 3-point line. I told they guys, it's just a hand ball line, not a 3-point line, because all the kids, because the athletes, see that line for the first time and just want to let shots fly." As the years continued, Brown coached some amazing athletes in the early 2000s. Athletes like former UCLA track standout Dominique Easterling and MLB star Jacoby Ellsbury. 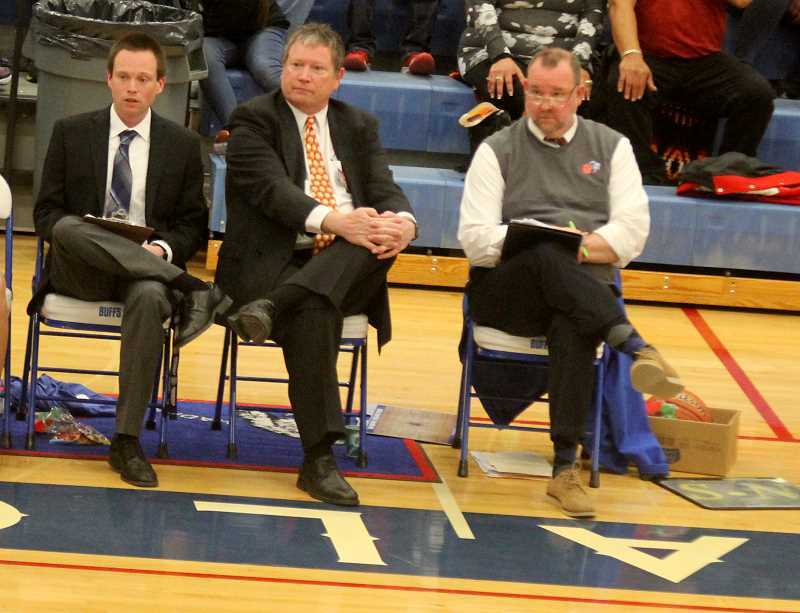 The following year, Madras was moved to the 5A Intermountain Conference for the 2006-07 season. The IMC added different teams like The Dalles, Pendleton, Hermiston, Crook County, Bend, Summit and Mountain View. Brown and the coaching staff knew that if Madras wanted to compete with those schools, something needed to change. With something new, different, and maybe a little unexpected, soon the community was about to witness the birth of the "three-diculous" years. "We were a very traditional team until that point (2006-07)," said Brown. "We played an aggressive man-to-man, really grind it on that 1-4 size. We were a little undersized, but then we were moved to the IMC." "We knew we had to do something and the team was going to be a lot smaller," he said. "The team was going to be absolutely tiny, especially in the IMC. We knew we had to do something different and just started looking at uptempo stuff." "We came across Grinnell style of basketball," Brown said. "The style just fit our personnel and the kids we had. I still say to this day, that I am not sure that style can win championships, but I am convinced, especially back then (2006), that it was the best way to be competitive." The Grinnell system started in the '80s by Coach David Arseneault, of Grinnell University. It was a combination of a run-and-gun style that relied on a ton of 3-point shots and full-court presses, while substituting players often. "Looking at it a couple years ago and knowing we were going to be undersized again, with guys that can shoot, we went back to it last year," Brown said. The fastpace, 3-point style took teams by surprise and the community was swept away by this new style of play. Three-diculous shirts were seen everywhere and kids were seen trying to mimic what they were seeing at the high school. The team finished the season with a 16-9 overall record, 9-4 in the IMC, scoring over a 100 points in four games, including a 126-83 victory over Dallas. The Buffs lost their first-round home playoff game to Crater 92-87. The buzz about one of the most exciting styles of play was created, but for Evan Brown, his journey as a White Buffalo was coming to and end, or so he thought. After the 2007-08 season, Brown decided we wanted to go further in his career and took a job as athletic director at Cascade High School, in Turner, Oregon. "When I left here, it wasn't like I was looking to leave, but I was looking to become an athletic director," said Brown. "I was ready for that change in my career and Cascade gave me that opportunity to be an AD and get a lot of great administrative experience." He would eventually leave Cascade for the AD job at Stayton. "The only reason I went to Stayton is because that is where my kids were going to school," he said. "Nick had just graduated when I became an AD, but Ethan was still going there, which allowed me to watch him play. I was struggling to watch them play when they were at Stayton and I was at Cascade." "When Ethan graduated, things just worked out well. The AD job opened back up in Madras, (in 2014) and I have always said the thing that brought us back to Madras is the people. The people in Madras are just great people. We were away for a few years, but it was really like we never left. We never felt that in other communities and that is really what brought us back. "I am a White Buffalo," he said. "I don't want to say the word destiny, but I really feel like I was meant to be at Madras High School. For some reason I connect with these kids well and they respond well to me. It is just the way it is." Allen Hair, his longtime assistant, had run the basketball program while Brown had been in the Valley, and had maintained its status as a quality program. But in 2016, Hair was ready to leave the post. As AD, it was up to Brown to fill the position, and he followed the wishes of nearly all Buffalo fans by taking the job himself. He'd coach the Buffs for three season. One of the best parts about coaching again is that he was able to do it with his son, Nick. Nick has coached the freshman team since 2015. "Nick grew up as a White Buffalo and is a White Buffalo at heart," Brown said. "He was born and raised here (Madras). We didn't leave until his sophomore year in high school. We asked him what he wanted to do after college and he said we wanted to go back to Madras. That was before we knew we were ever coming back." "Coaching is in his blood," Brown said of his son, a Gonzaga graduate. "It has been a lot of joy coaching with him and a lot of fun. We just have some great basketball conversations, whether it is in the car or at the dinner table. It was really good to have Nick here and be able to mentor and work with him." 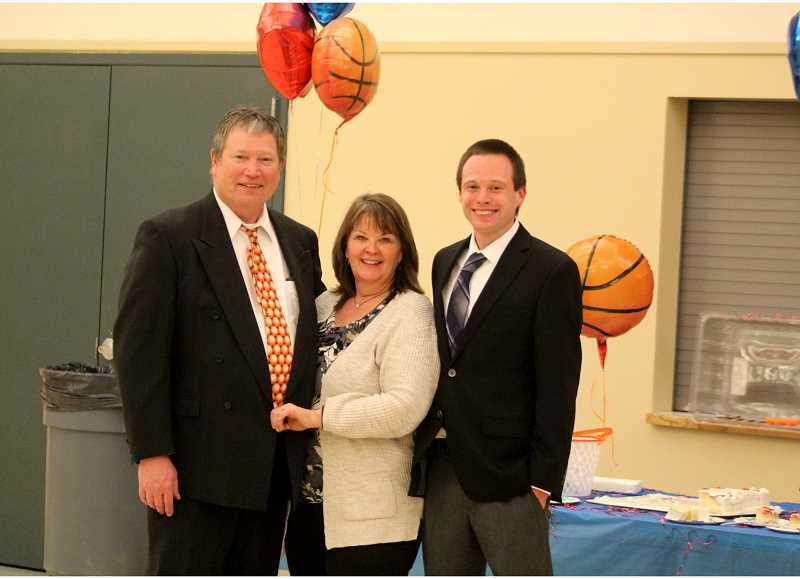 On Feb. 19, Brown coached his final game as a White Buffalo and after a fitting, high- scoring 95-79 victory over Estacada, a small reception was held in the cafeteria to honor Brown's coaching career. Former players, and fans came for cake and stories of the former Madras coach. Hair, who has been at Brown's side for hundreds of games, spoke and told stories and memories of Brown and his long coaching career. "To me, it never feels like the end, but just a different chapter," said Brown about stepping away from coaching. "This was such a big part of what I have done here in Madras. I wouldn't say it is a big part of who I am or think coaching identifies me, but just a part of me. I am really looking forward to changes in my life and doing different things." "I think what people know and realize is, I was offered a lot of different jobs to leave Madras," he said. "I always said, to leave Madras, it would have to be something better. In the coaching world, there was nothing better. It is a great place to be a basketball coach, a teacher, and to make a difference in kids' lives." "Hopefully, I have made a positive difference over the years," he said. "Could I have been more humane when I was younger? Absolutely. Hopefully, I haven't tarnished too many young men, but had more of a positive effect and influence on a bunch of them."